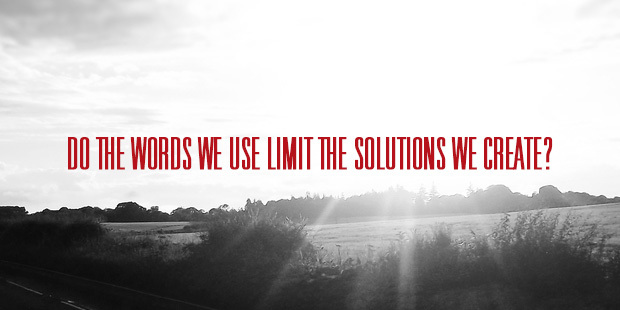 Do the Words We Use Limit the Solutions We Create? Uncaging vision involves meticulous articulation. Every single word, metaphor or story that drives your vision must be carefully created if you want to have a stunning impact. Language is paradoxical. In some ways, it doesn’t keep pace with the rate of societal and technological change (e.g., TV show, carbon copy) and in others, new words are created almost daily in response to our fast-changing world (e.g., selfie, MOOC). There is a balance between using the past to understand the present and guide the future, on the one hand, and on the other, creating something fresh that leaves the old behind. We need analogies to understand the new (e.g., horseless carriage) yet they also hold us back by it constraining our thinking (e.g., horseless carriage). So I have a challenge for you. Watch your language and the language of those around you. See what words you are using and how you’re using them. Do they help you and your organization move forward? View the world differently? Open your mind to new possibilities? Or do they constrain how you view the world? And when you change the words, does the world change as well? “Now, we really live.” I left that day greatly encouraged that another “everyday” pastor was pressing into and wrestling through the art of word choice. Another pastor was becoming a skillful visionary. So if the words we use as leaders do indeed create worlds for our followers, what, may I ask, are you saying? Want to learn more about the importance of language in communicating your vision? Connect with an Auxano Navigator. In 2004 the marketing guru David Aaker, published a book entitled Brand Portfolio Strategy, in which he describes a tool called a “Brand Relationship Spectrum” to help simplify the world of brands when companies steward multiple products or services. Revisiting his book will help us create a very simple, three-part language for church leaders. Understanding these basic strategies can have a profound impact on how your church communicates. But before moving on…Even though, the “b-word” can be lead to resistance from the church crowd, it shouldn’t. 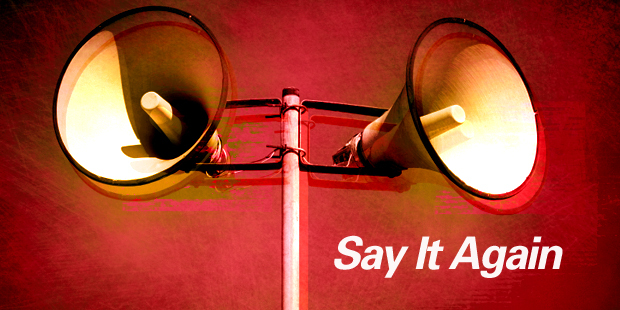 Branding is simply how your church builds relationships with communication tools. The genius of tool is represented by two terms that Aaker used to coin the ends of the spectrum. On one end of the spectrum he identified a strategy called the “Branded House” to describe a company like Apple, Harvard or Cisco, where one unified brand is the sole driver for many products or services. For example, Apple creates products like iPhone, iPod, iPad, iTunes, etc., but they are driven primarily by the Apple master brand. On the other end of the spectrum is the strategy of the “House of Brands” to describe the diversity of stand-alone brands that all belong to one relatively invisible company like Procter & Gamble or Yum Foods. For example Yum brands represent, KFC, Pizza Hut, and Taco Bell. But when you eat at these establishments, you don’t encounter the master brand at all. Most ministries, however, live between the two ends of the spectrum- somewhere between “Branded House” and “House of Brands.” Therefore we name the third way- in the middle- as “House Blend.” This in-between language was created by a friend and brilliant dude, Armando Fullwood. The “House Blend” – This is an architecture based on the development of sub-brands with the added credibility of the existing parent brand. Google, for example, started as a search engine then continued to establish the primary brand through offerings such as Gmail, Calendar, and Maps. Eventually, they began to acquire other, smaller tech companies such as Blogger, Picasa, and YouTube. These acquisitions maintained their existing brands but gained credibility through the primary brand of Google. Another example, is Nabicso. They own many retail brands that consumers recognize like Wheat Thins, Ritz, and Triscuits. But you will see a master brand visual from Nabisco on a box of Wheat Thins in the upper left-hand corner (you can probably picture it.) That would be an example of the House Blend strategy. Smaller organizations that are still focusing on gaining market share need to choose the architecture that will help them grow the fastest. A “House Blend” is most often the wrong choice in these cases. House blends thrive on the credibility of the parent brand. If a smaller company has a product or service that they would like to introduce into their existing structure, it’s usually a good idea to create a sub-category of their existing brand rather that creating a new brand for that product or service. This makes a “Branded House” architecture an excellent choice. Also, non-profit, experience-based organizations such as churches thrive on branding simplicity. For example, in a church with multiple ministries it can be tempting to create a new brand/logo for each division (House of Brands or House Blend). However, this creates internal competition. Each brand begs for attention from the attendee and struggles to be recognized as “part” of the main brand. Many times, each ministry feels the responsibility to develop their own brand, which can consume an enormous amount of energy. Instead, try focusing on your main brand and simply categorizing ministries under that brand. For example, if Faith Church has a children’s ministry, it wouldn’t have it’s own name…it would simply be the “Faith Church Children’s Ministry”. 1) Why do churches tend to fragment their message so much? 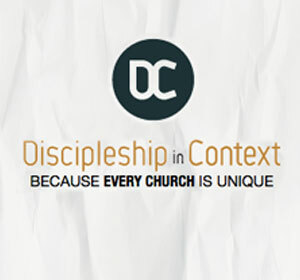 2) What about the missional church? How does branding apply as it sounds so “corporate” and old school? 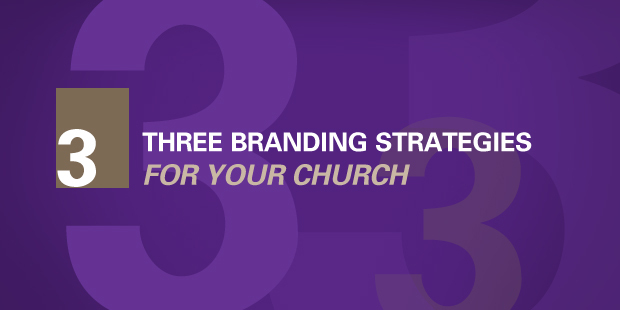 3) How do you know when its time to launch new ministry sub brands in a large church? 4) What does a well developed communication and branding strategy look like? Would you like to learn more about branding for your organization? Connect with an Auxano Navigator and start a conversation with our team. Many of the failures in leadership are failures to communicate well. No matter how smart we are or how good our strategies are, they are doomed for failure if no one understands them. In previous articles, I dealt with poor written grammar, so much so that some of my friends refer to me as “the grammar cop.” In this article, I deal with five of the more common communication mistakes made by leaders when they speak. Too much information. An audience can only absorb a limited number of facts in a given presentation. Some leaders attempt to cover a multitude of items, leaving the hearers bored, confused, and frustrated. Speak to the essential issues and provide supplementary written material if necessary. Too many visuals. PowerPoint and other visual aids can be either a help or a hindrance to a speaker. Too often leaders try to put too much information in visual aids. At that point the aid becomes a barrier to communication. Consider having no more than one visual aid for each three minutes of speaking. You might be surprised how much the retention of your listeners improves. “Insider” language. Acronyms should be banned from speaking presentations. At my organization we have one acronym for every molecule that exists in our building. Those who are on the inside may think it’s okay to use acronyms with other insiders. The problem is that the pattern of speaking develops into a habit that will creep into external presentations. Indeed, good speakers avoid acronyms and insider technical words unless they are clearly explained to the audience. Insufficient pathos. Aristotle divided the means of persuasion into three categories. Ethos is used to establish the credibility or character of the speaker. Logos means persuading by reasoning or logic. Pathos means persuading by appealing to the readers’ or hearers’ emotions. Too few speakers attempt to speak to the hearts of the audience through personal illustrations, humor, or captivating stories. As a consequence, the presentation is often deemed dry and boring, regardless of the quality of the content. I continue to be a student of effective communication. I still have a long way to go. What could you add to this list? What stories or examples do you have of either effective or ineffective speaking? Do you need help with your communication skills? Connect with an Auxano Navigator and start a conversation with our team. 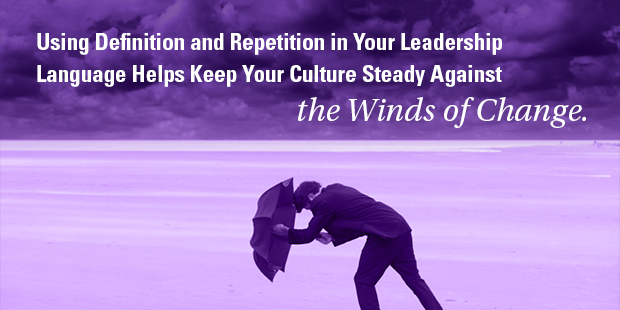 When the winds of change blow against your church culture, what keeps it steady? The visionary leader cares too much about the message to let it just blow in the wind, unattended. Wise leaders understand the importance of words. They grasp the importance of language in describing the culture of the organization and the direction she is headed. But the role of a leader in relationship to language does not end when the doctrinal statement is finalized. It does not end when the mission and values are clarified, placed on a wall, and boldly declared. Leaders must continually remind people of the meaning behind the words, behind the language that is essential to the organization. The important words need definition and repetition. Words must constantly be defined, or the words will lose their original intent and begin to mean different things to different people. Language drift often occurs as people in an organization learn the desired or accepted organizational vocabulary and use those words as taglines in an attempt to give credence to just about anything. For example, if “community” is the current focus for a local congregation, a leader can add “community” language to any initiative or event to give it credence. Similarly, if “customer-centric” or “narrowing the focus” are the latest buzzwords in an organization, folks can start to haphazardly use these words without understanding the intent and heartbeat behind them. Pretty soon, the words carry an array of definitions and lose their singularity and potency. Unless there is constant definition of what the important culture-shaping words mean, there will not be alignment. In fact, if the important words are allowed to mean a plethora of things, if leaders don’t constantly define the words that are used, the language will only create confusion and a plethora of directions. If you are a leader, it is important to define the important terms/words in the organization you are leading. If you hear words that are important in your culture being used in a way that does not match the original intent, some definition is necessary. Some leaders run from repetition for the desire to always say something new and fresh. But wise leaders understand, as Max De Pree said, “Leadership is like third grade: it means repeating the significant things.” For example—because the gospel is the principle and essential doctrine of the Christian faith, Martin Luther stated “most necessary is it that we know this article [the gospel] well, teach it to others, and beat it into their heads continually.” Luther was clearly passionate about repeating the most important message continually. When it comes to articulating a direction, I have learned that when the leaders are sick and tired of presenting and discussing, people are just then starting to grasp it. Both definition and repetition are necessary. Language is the crystallization of thought. But the words we choose do more than just reflect our thought patterns—they shape them. What we say—and how we say it—can deeply affect a company’s culture. To spark innovation, it helps to influence the dialogue around new ideas. The “how” suggests that improvement is always possible. The only question remain­ing is how you will find success. The word “might” temporarily lowers the bar a little. It allows you to consider wild or improbable ideas instead of self-editing from the very beginning, giving you more chance of a breakthrough. And the “we” establishes own­ership of the challenge, making it clear that not only will it be a group effort, but it will be our group. Using this phrase is not just a matter of semantics. Thoughts become words, and words become deeds. If you get the language right, it affects behavior. Defenders of the status quo often say, “We’ve always done it this way” or “Nobody does it like that.” With a series of “why” questions, an eight-year-old could disarm such defenses. But adults sometimes forget the simple power of words. 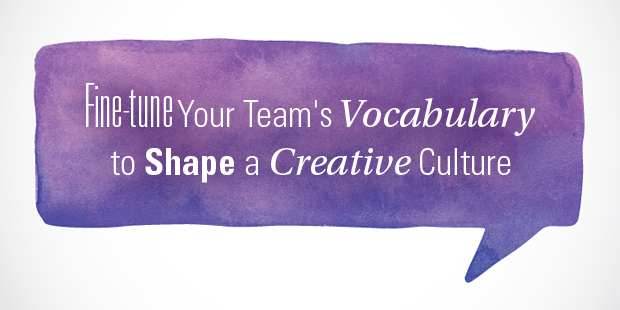 Try fine-tuning your group’s vocabulary, and see the positive effect it has on your culture. Adapted from Creative Confidence, by David and Tom Kelley. Would you like help in fine-tuning your team’s vocabulary? Connect with an Auxano Navigator and start a conversation with our team. The world isn’t looking for a copy of an existing writer, musician, politician, CEO, or leader; they’re looking for someone new, innovative, and original. Your job is to discover how your unique gifts and talents can differentiate you from everyone else. You have no idea the number of people who call our offices each week asking us to “do the same thing for us that you did for your national clients.” They want to copy someone they admire, and they’re asking us to help get that story out there and get noticed by the national media. But they’ve got it backwards. There’s already one of those famous leaders. A new person needs to emphasize his or her unique differences. Besides, each of our clients were unique and brilliant long before I ever met them. Probably the most powerful gift these leaders had was an understanding of who they were and what their talent and calling were about. That’s something worth repeating: Probably the most powerful gift these leaders had was an understanding of who they were and what their talent and calling were about. Having an accurate understanding of what makes you unique and different is absolutely critical. For many, an accurate understanding is obscured or undermined by a lack of professionalism, bad ideas, poor taste, inept leadership, insecurity, lack of people skills, bad assumptions, and more. 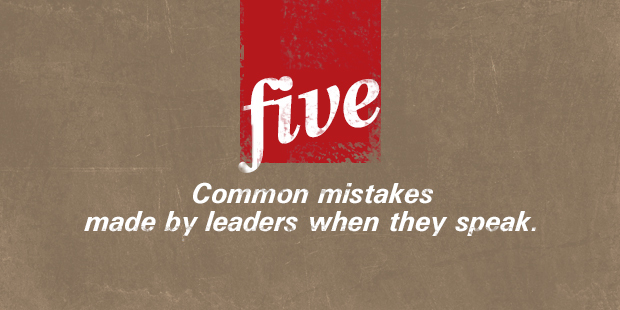 These sorts of things plague many leaders today and hamper their effectiveness. What makes you different from all the others competing for your position? There’s even more competition out there within the greater culture. In today’s world, everybody competes. For media creators, product producers, sales professionals, and more–how can you compete with all the entertainment choices, lifestyle options, or new digital technologies that struggle for the limited time of the average person today? You may not have the resources, finances, or assets the competition has, but you can tell a better story, and the key to finding that story is discovering what makes you unique and different. What could it be that makes you different? Perhaps it’s your unique communications style, your writing ability, your personality, or an expertise in an unusual area. Being different can mean many things, including perspective, content, skill, and delivery. If competition from others is making it more difficult to get noticed, then perhaps you should consider a different niche. Some organizations have decided that because of duplication of services by other companies in the area, they should find a different way of doing their work or do it in a different place. Hollywood is particularly good at this; studios track what other studios are developing so they don’t release a similar film. Corporations spend enormous amounts of money following their competition’s product development. Even smart employees watch for potential changes in company staffing or structure to ensure they don’t get pushed out of a job because of duplication or competition. It’s not about conniving or cheating behind the scenes–it’s about being aware and sensitive to the future. Ultimately, it’s all about authenticity. Being unique and different shouldn’t mean fake. In our efforts to relate to the culture or a potential customer or audience, we sometimes go over the top and end up conveying a message that’s obviously dishonest and far from authentic. I’m told I was born with the gift of saying what everyone else in the room is thinking. Whether it gets me in trouble or not, I often feel compelled to talk about the elephant in the room that everyone else sees but ignores. That’s why this issue of authenticity is so important for me. I was born with a very sensitive BS button, and anytime a client presents an advertisement, website, TV program, or other presentation that smacks of insincerity, I light up. I regularly meet people who live out others’ dreams and refuse to act on who they were created to be. What about you? Have you watched your boss so closely that you’ve started becoming more like him or her than you? Have you followed a celebrity to the point where his or her style is obscuring your own? Have you followed trends to the point it’s difficult to discover what’s really inside you? Don’t become something you aren’t; developing a personal brand is about becoming who you truly are. It happens even in the best of ways. One friend got involved in raising money to build medical facilities in Third World countries. It was a great cause and she certainly could have spent her life doing worse. Ultimately, it wasn’t really her passion. But she put off confronting that fact for years because it was such a great cause. The problem was–it just wasn’t her cause. When she finally had the courage to step out into something she was personally passionate about, she had already wasted years of productivity. I know others who are trapped working in a company, church, or humanitarian organization who–although they do great work– are settling for second best in their lives. I can see they have so much more potential, but when I bring it up, they rationalize it with the importance of the cause, the need, or the great work they’re doing. They’ve been sucked into a regular paycheck, or refuse to change because they’re not willing to risk taking a hard look at their lives, their gifts, and their future. Finding your honest voice in the middle of the madness is absolutely critical. But being absolutely truthful about what distinguishes you from the pack is a critical step to finding your identity. Excerpted from One Big Thing: Discovering What You Were Born to Do by Phil Cooke. Read more from Phil here. Phil Cooke, Ph.D. – filmmaker, media consultant, and author of One Big Thing: Discovering What You Were Born to Do; Unique: Telling Your Story in the Age of Brands and Media; and Jolt! Get the Jump on a World That is Constantly Changing. 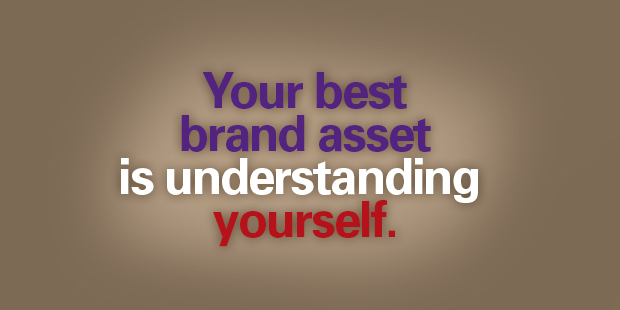 Would you like to learn more about developing the brand asset called You? Connect with an Auxano Navigator and start a conversation with our team. Do You Know WHY People Like Your Church? Do we care about talking to each other anymore, or are we settling for mostly texts, emails, tweets, and similar electronic quickies? We often think that quick communication saves time. This is true in some cases. But relying only on cursory communication runs the risk of misunderstanding, and a lot of hoopla about “what did she mean by that e-mail?” Once those questions get started, they take on a life of their own and end up as huge time wasters, not time savers, and the intent of the communication may be lost or so badly misinterpreted that trust goes astray in the translation. Let’s regroup and think about the advantages of face-to-face communication, what might get in the way, and types of skills that promote cooperation even in difficult instances. Face to face communication motivated by care and concern can be so meaningful. But meaningful discourse has a lot of components, many of which are ignored—often unintentionally—no matter how many training classes are offered on the subject of communication. What does invalidation look like? 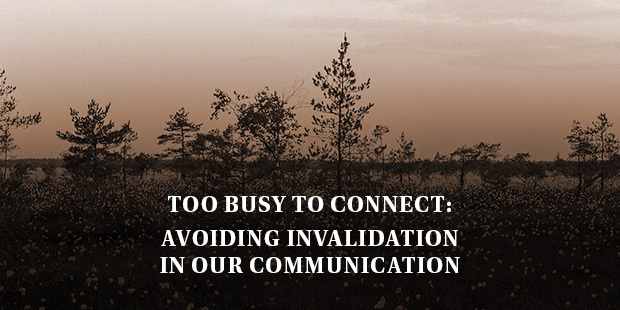 How do we invalidate each other in our conversations? Negative comments are remembered much more than positive regard. In the adult world, we may be thicker-skinned, but we remember. There are at least 10 common ways we often invalidate others every day. >>Maxine Kamin, president of TOUCH Consulting, Inc., develops this idea in a free resource you can download here. Maxine Kamin is president of TOUCH Consulting, Inc.: The Personal Touch in Business. She is an author of internationally recognized books and training guides for the American Society for Training and Development such as 10 Steps to Successful Customer Service and Customer Service Training. I find it interesting that Jesus would have to say anything again. You would think that the Son of God wouldn’t have to repeat himself for people to get the message. Once should have been enough. But throughout the gospels there are instances where Jesus finds the need to say something again, and he then either builds on something he had said before or gives it a slightly different interpretation. It’s the same essential message. Only expanded, clarified, or taught in a new way. I think Jesus knew something that every leader has to grasp: you can never repeat your vision too much. There isn’t a single leader who has cast their vision enough. No matter how many times you’ve said it, there’s always someone out there who hasn’t gotten it. Or someone who has lost it. No one can hold onto any vision indefinitely without reinforcement and repetition. It doesn’t matter how compelling it is. Was any vision ever more compelling than the one Jesus laid out? Yet even he found the need to say it again. And you’re going to need to as well. People inevitably lose sight of why they’re doing what they’re doing. They get distracted by the practical realities of getting their work done. They lose the enthusiasm they had when the vision was fresh in their minds. It happened to the disciples who were with Jesus day and night for three years. So it’s definitely going to happen to people you see for only a few hours a day. Or in the case of pastors, only once or twice a week. This doesn’t mean you simply have to verbally state your vision or mission statement over and over to your people. You can repeat yourself without being repetitive. Find fresh ways to cast the same vision you have been casting for years. 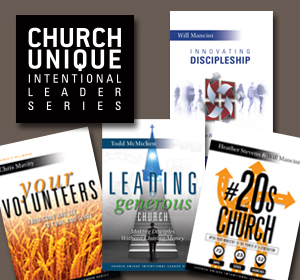 Explore new angles from which you can communicate the heartbeat of your church or organization. You might have an incredible vision that has the potential to ignite passion in people’s souls and move them into action. Be excited about it. Be thankful for it. Never compromise it. But it isn’t better than Jesus’. If Jesus had to repeat himself, what makes us think we can do anything less? No matter how compelling your vision is, say it again. Want to learn more about communicating your vision – over and over? Connect with an Auxano Navigator and start a conversation with our team. Pastor Steven Furtick is the lead pastor of Elevation Church. He and his wife, Holly, founded Elevation in 2006 with seven other families. Pastor Steven holds a Master of Divinity degree from The Southern Baptist Theological Seminary. He is also the New York Times Best Selling author of Crash the Chatterbox, Greater, and Sun Stand Still. Pastor Steven and Holly live in the Charlotte area with their two sons, Elijah and Graham, and daughter, Abbey. Church Communication Hero: Martin Luther King, Jr. In his book The Talent Code, Daniel Coyle tells the fascinating story of some experiments that Stanford psychologist and author Carol Dweck has conducted with fifth graders in multiple settings. The subtle and small difference made a big impact. In preparation for the next test, the children were asked if they wanted to try an easier test or a more difficult one. As a group, those affirmed for their hard work wanted the more difficult task and the opportunity to learn. Those affirmed for their intelligence wanted the easy test. Likely they believed intelligence was the chief value, and they feared losing their good standing, their identification as the smart ones. In another round of tests, more difficult in nature, the children who were affirmed for their intelligence gave up much more quickly than those who were affirmed for their hard work. The students returned to the original test, and the “you must be smart” group scored 20% lower than they did at first. The “you must have worked hard” group improved their scores by 30%. The point, according to both Coyle and Dweck, is the language “you must have worked hard” fosters motivation and a growth mind-set, while the language “you must be smart” fosters the belief that intelligence is fixed. The small change in language makes a profound impact. In organizations, in churches, and in families, language matters. Many have said that “words create worlds,” and I have found the phrase to be true. 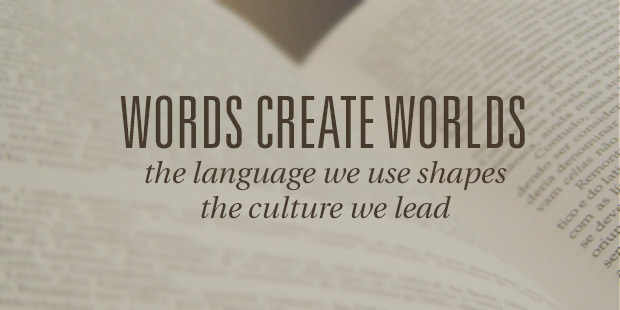 As leaders, the language we use helps shape the cultures we lead. The words you use to articulate your mission, values, and strategy are essential. You can use language as a powerful tool to bring clarity and direction to the teams you lead and the people you serve. Or you can, as many do, underestimate the power of language and create confusion without careful attention to the words that describe the direction of your organization. Would you like to learn more about using language as a powerful tool to bring clarity to your church? Connect with an Auxano Navigator and start a conversation with our team. Is Your Website Really Working? The Power of One Word: Can You Describe Your Church in One Word? When I first encountered Facebook it was when I was at a speaking event on a University campus that had access to up-start social network trying to take on MySpace. The student leaders we met with for lunch we’re talking about this amazing new tool for connecting with each other. It seemed like a fun “on campus trend” but never did I imagine the impact it would have on the ministry world. How could a tool that made it easier for a group of students figure out which pub they were heading to impact our church? Distant from Your People // If you are silent on social media you will increasingly be seen as aloof and disconnected as you refuse to be transparent to your community. Imagine a preacher who never told any stories about themselves? People will see you in the same light if you don’t use these tools. Personal Medium // 87 of the top 100 accounts on Twitter are for people not brands or organizations. These tools are designed to make personal connection with people. As a church you can leverage them … but they are meant for people to connect with individuals. Content Curation // Your people are out in the internet finding content of spiritual significance. Using social media to point to other sources of uplifting content is a part of your role. Equipping your people to follow Jesus can’t be outsourced to someone else … it’s a critical part of being a pastor. When you are silent on social media you are missing an vital opportunity to build up your community. Insight Into People // Church leaders live in a bubble … often everyone we know is a part of the church. If we don’t work intentionally at it we will become isolated from the world we are attempting to reach. Engaging in social media gives you insight into the lives of people around you. Listen and watch what people are talking about it … it will give you insights to be a better leader. Don’t Be Left Behind // Social media is moving beyond a fun tool for people to connect with friends to a critical communications channel. Not personally using social media is like refusing to have an email address or deciding that cel phones are too modern of a technology … you will become increasingly left behind by culture. You will lose influence. It’s not about being cool … it’s about connecting. Read more from Rich here. Would you like to learn more about social media and other practices in the area of Church Communication? Connect with an Auxano Navigator and start a conversation with our team. Spot on. Great article. Thanks! Spiritual Leaders need to be a voice in society. And social media is a great place to connect, and shape society. For those who think it is a waste of time I simply refer you to 2 Corinthians 10. "The tools of our trade aren't for marketing or manipulation, but they are for demolishing that entire massively corrupt culture. We use our God-tools for smashing warped philosophies, tearing down barriers erected against the truth of God, fitting every loose thought and emotion and impulse into the structure of life shaped by Christ. Our tools are ready at hand for clearing the ground of every obstruction and building lives of obedience into maturity." - the Message Bible Facebook is a place to use our God-tools! So use them well. Im a big believer in Social media and that we should adapt to what it has to offer,but we must know where to draw the line. Jesus in Matthew chapter 23 addresses the leaders of the day and and warns them about their proud ways,where they love to be greeted in the market places and to be seen by men,today that same thing is again creeping into the church,they love the 'likes' and al the comments they get,and they advertise themselves posing in their beautifull 'robes' bragging about the amount of hits they got on their latest revelation, and dont forget the long titles and resumes.... When we use social media lets not forget that our example is Christ and we should always show people to Him.Humility is His example. No one said social media should replace shepherding. The concept is to use it as an adjunct to face to face interaction. Why are so many Internet Christians all or nothing reactionaries? I too, fully agree with your responce Miles, I just wonder why it even needs to be stated. That anyone could entertain the idea that virtual fellowship/shepherding could replace actual fellowship/shepherding is a commentary on the sad direction many Christians are heading. Communication through typing is a terrible way to attempt spiritual fellowship. Any real communication on a spiritual and personal level requires looking into someone's face, hearing the inflections in their voice and discerning their spirit. What's next... digital communion and baptism? Click here for ... worship? 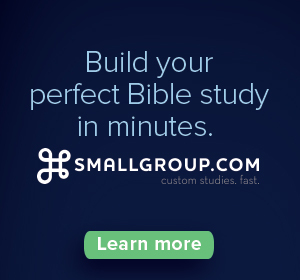 And what in the world (literally) is an online church? Where is 'Convient Christianity' leading? Lastly, if the Bible is our rule and precedent and we all know it should be, then the contemporary church has not become just less socially minded than the early church it has become less biblical... and thus less valid. The general tone of the article is pragmatic and utilitarian. However, media ecologists the world over recognize that the use, or disuse, of such tech effects not only communication itself, but also those who use it. Such effects must be understood, discussed, and taken into account when used. Sometimes, (we) pastors should, indeed, refrain from such activities...and insist our people do so, too, due to the effects they have on human behavior, interaction, and ability to understand speech or read prolonged texts. But I did find this via a Facebook post. I agree with the notion that ultimately people connect with people on Twitter/Facebook. I disagree with the notion that a pastor HAS to utilize these in order to be effective. Preaching God's Word and ministering to people (in real life) are the two most critical components of pastoring. Social media would be a contextual thing. In some places it's probably more beneficial to be active, but in rural areas I can guarantee it's not as influential. Regardless, social media is a tool that should be wielded well if used (not allowed to be a distraction), but it is in no way necessary for watching over the flock entrusted to you. I'll say it like this, if your interaction with someone is mostly on social media, it is likely a mostly shallow relationship. Good points, but I appreciate David's concerns as well. The Church at large has become much more "Anti-social" when compared to the early church. 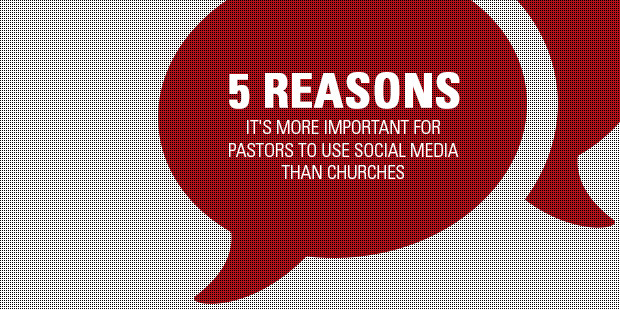 Social media has many great benefits, but the great caution is that it never replaces or compromises the pastor's responsibility to tend his sheep in person. Great article! My people use social media to talk to each other and their friends. If I don't know how to use this channel, or if I refuse to use this channel, I'm losing a real opportunity to encourage them in their walk with the Lord. Well said Rich! I couldn't agree more...relevance is diminished or enhanced to the degree Pastors are engaged and connected. I don't want to appear as one more critical opininon giver ... but... just what are you doing to provide a living demonstration of the church of the scriptures? Spouting my opinion on the social media is fun ... but just what good does it do the people who want to see an answer to the mess called contemporary christianity? I am a missionary in Kenya and am pretty fed up with the western version of church. Sorry if this sounds too critical. People are sick of hearing about Jesus without a demonstraton of what He was saying. Couldn't agree more. While I'm not as savy as I wish I was, I'm keeping up and learning more every day. Love it!!! Great article. Social Media is such a great tool. I can't understand why pastors don't take advantage of a resource that will take their leadership beyond the pulpit and into the daily lives of their people. Thanks for sharing your insights.